4.2 out of 5 based on 100 bloggers and 27 commenters. 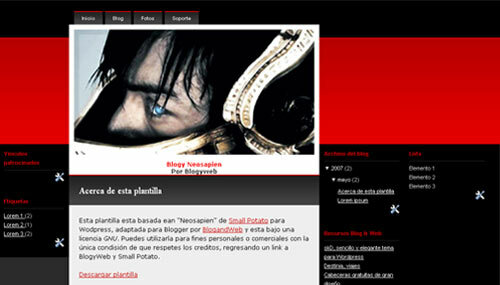 Neosapien is a free blogger template adapted from WordPress with 4 columns and left and right sidebars. Excellent template for blogs about music or people. download corrupt!!! email me when fixed? thnx! Is ready, please try again. 1o- tenemos el mismo problema que Fernando. Hay alguna manera de evitar que las columnas de la derecha se muevan hacia abajo al no tener el explorador maximizado? 2do.- utilizando Mozilla Firefox la imagen del encabezado queda corrida. Francisco: We loved you template but we’d like to change the image of the blue eyed guy, can we do that? Or it’s impossible? plase answer.. we would really like to use it. Nos encantó tu template pero nos gustaría cambiar la imagen del chico de los ojos azules por otra que refleje nuestro blog. Es posible? realmente deseamos usarla. and replace link to image with another, that shall show some other picture. p.s. Boy looks like he’s in mental institution, or being tortured. something like that. I find it as very dark, and twisted template. & I like it. Como hago para cambiar la imagen del banner? How can I change the banner image? i cant use the template. it show error.. pls help.. i really like and wanna use this temp. He intentado instalar varias plantillas de vuestra pagina (Neoneon y Neosapiens) y siempre me da errores. Desde google me dicen que me dirija a vosotros. La verdad es que he visto otras, pero me parece que las vuestras son muy buenas. ¿Sabéis a qué se puede deber? Yo supere ese error sacando los gadget, pero cai en otro error distinto. Excelente plantilla yo la uso y la modifique un poco solo quiero saber como cambiar la franja roja de arriba y si puedo colocarle alguna imagen. Gracias. i wanna make some canges in it… love it! Hi, Can the blue eye guy image be changed? Also can we put stuff in the red areas on the both sides of that blue eye guy image? Thanks! Saludos amigos y gracias por la plantilla. Can someone PLEASE put this in english. How can I change the existing image to one of my own? Also, since I only speak english, how do I change the catergories on the header ro read something more in line with my site? please help!!!! this is an awesome theme..i use it on my wordpress blog as well…. @prateek dixit You can find the answer to your questions and more in our FAQ section.